I tried to load onto my droidx without success. The file downloads but will not open to install. Tried several times with the same result. As this app is not yet in the Market, you must enable "Unknown Sources" under Settings->Applications. Is this enabled on your DroidX? Unknown sources is activated. When I try to open the file, there is no error or any other message. I click open and the phone goes back to the downloads folder. Hmmm... I just used my stock Droid web browser to download the file from this site, tapped on its entry in the notifications pull-down, and it opened right into the installer where it installed without problem. I can't figure out why this would be a problem on the Droid X. Are you using a the stock web browser to download the file from this site? Have you tried cleaning out your downloads folder and then going back into the browser to re-download? Are you using something other than the browser to "open" the file? I have been using the Opera browser. This seems to have been the problem, since when I downloaded and installed with the stock browser (4.77) everything went fine. Thanks for your feedback. Daycm,The app is currently available only for the Android operating system. To use the app, you will need a device that runs Android. 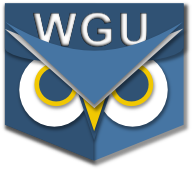 If you have an Android device, run the "Market" app on that device and search for "PocketWGU" to install it.I hope that helps!